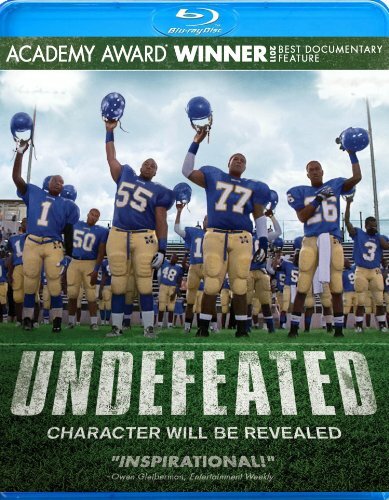 A Rousing And Inspirational Film About An Underdog Football Team And The Coach That Helped Them Realize Their Dreams, Undefeated Hits The Field On Blu-Ray(TM) And DVD On February 19, 2013! BEVERLY HILLS, CA - Anchor Bay Entertainment and The Weinstein Company announced today the Blu-ray(TM) and DVD release of the uplifting Oscar(R)-winning football documentary, Undefeated , a directorial collaboration from filmmakers Dan Lindsay (Why Us?) and TJ Martin (A Day of Hype in America). A true story about courage and character, Undefeated follows the Manassas Tigers - a severely underfunded and underprivileged high school football team - as they endeavor to reverse their fortunes with the help of a volunteer coach, Bill Courtney. Heading to retail on February 19, 2013 for an SRP of $24.99 for the Blu-ray(TM) and $19.98 for the DVD, Undefeated is a one-of-a-kind sports movie that will thrill and inspire - a moving affirmation of all that is best in us and all that is possible. Undefeated is "Irresistible," said New York Times film critic, Manohla Dargis. Wrote Marshall Fine in his STAR Magazine review, "This is a sports movie with heart! You'll be cheering until the end." Added Entertainment Weekly's Owen Gleiberman, "Suffice it to say that the agony of defeat in this movie is every bit as transporting as the thrill of victory." No hope. No future... Until a football season united a team and revealed the character that turned them into heroes. UNDEFEATED, an Academy Award(R)-winning documentary (2011 Best Documentary Feature - Dan Lindsay, TJ Martin and Rich Middlemas), is the inspiring and moving tale of three underprivileged student-athletes from inner-city Memphis and their volunteer coach, Bill Courtney, trying to help them beat the odds on and off the field. The Undefeated Blu-ray(TM) and DVD special features include an Audio Commentary with directors Dan Lindsay and TJ Martin; Deleted Scenes; a Black and White Teaser Trailer; and a "The Making of Undefeated" featurette. Note: Special features are subject to change. Rating: Rated PG-13 for some language.